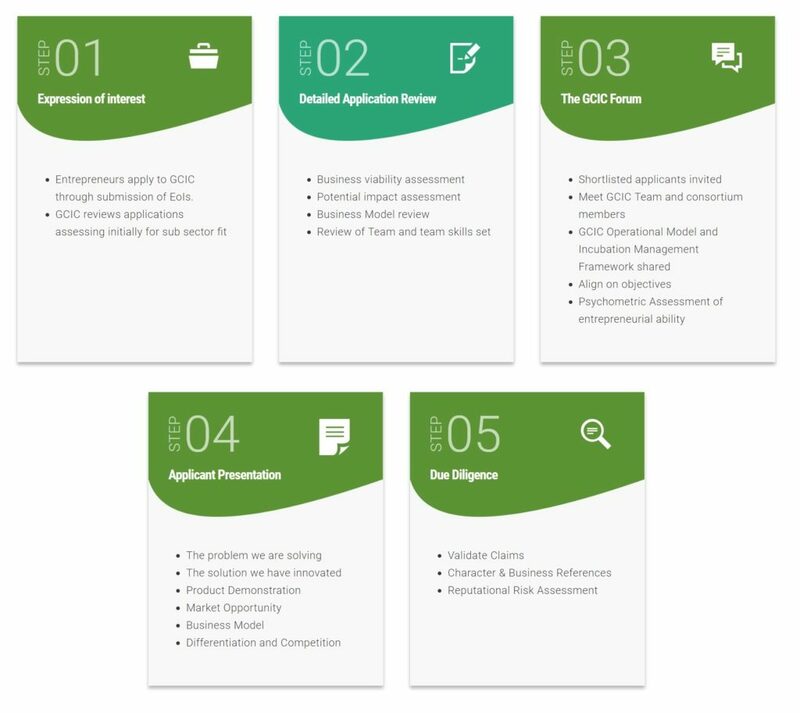 Founded in 2016, GCIC is a pioneering business incubator with a unique focus of developing SME ventures and entrepreneurs in Ghana’s ‘Green Economy’. Our mission is to develop and support an exceptional set of transformational ventures and entrepreneurs who are pioneering adaptive and mitigating solutions for climate change issues in Ghana. We do this with a focus on five key economic sectors (energy efficiency & renewable energy; solar power; climate smart agriculture; domestic waste management; water management and purification), the provision of premium business advisory and business mentoring services, technical support in the development, prototyping and testing of their innovation, as well as financial Proof of Concept grants to qualifying SMEs within our incubator. GCIC is funded by a grant from the Governments of Denmark and the Netherlands through the World Bank, and is managed by a consortium led by Ashesi University, and including Ernst and Young, SNV Ghana and the United Nations University. The Consortium offers the perfect mix of experience and excellence in private sector development, climate change, entrepreneurship, education and training, and research and development know-how. GCIC is part of the World Bank’s infoDev Climate Technology Program, a unique programme that supports high-growth, clean-tech companies to commercialize and scale the most innovative private sector solutions to climate change. The CTP’s global network of Climate Innovation Centres includes centres in the Caribbean, Morocco, Ethiopia, Kenya, South Africa, and Vietnam. Our operational framework boasts five responsive, innovative workstreams led and executed by one of the consortium members. Ashesi University is a Ghanaian private non-profit university globally recognized for quality and innovation in tertiary education. The mission of Ashesi is to educate a new generation of ethical, entrepreneurial leaders in Africa; and to cultivate within the students critical thinking skills, concern for others, and the courage it will take to transform their continent. Ashesi provides exceptional teaching, has expanding research capabilities, and has a growing capacity to transfer research and projects into entrepreneurial solutions. The University has consistently received acclaim for the independent, critical thinking capabilities of its students, and has a 100% placement record with its students receiving job offers and or starting a business within 6 months of graduation. EY is a global leader in business advisory, transaction, assurance and tax services, and has extensive expertise in fund management as well as business support to enterprises in the small and growing business sector. Over many decades EY has provided professional services (ranging from innovation to implementation) to Cleantech climate innovation ventures CIVs across the globe, and has the leading audit share of the Global Cleantech 100 companies. The firm currently works with companies across the cleantech landscape, from renewable energy to technologies for efficient water management. SNV was founded more than 50 years ago and operates 38 country offices worldwide with well-developed systems for supporting international development programme across a range of sectors. Since 2012, the organisation has focused its activities in three main sectors; agriculture, renewable energy and water, sanitation & hygiene (WASH). SNV works to fight climate change via climate smart agriculture and through the integration of climate change mitigation and adaptation initiatives as a cross-cutting theme in the priority sectors of renewable energy, agriculture and water and sanitation.